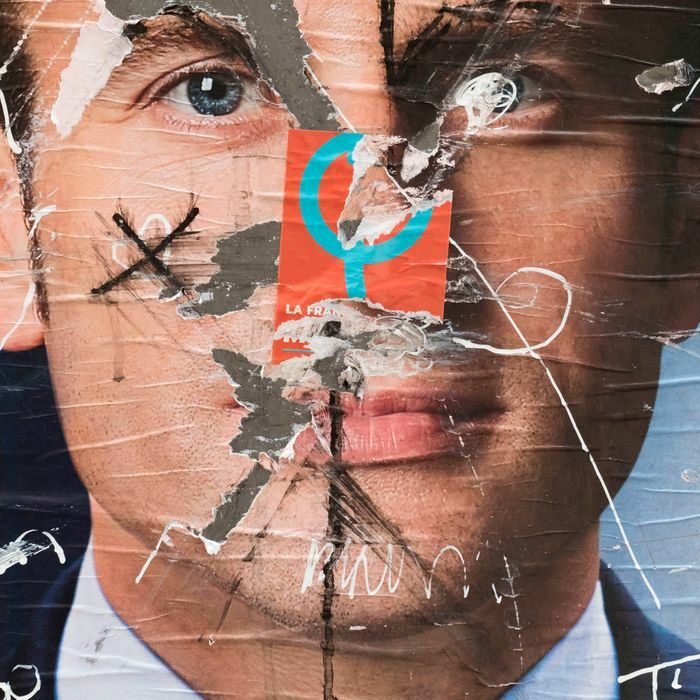 A vandalized poster of French presidential candidate Emmanuel Macron. The campaign for Emmanuel Macron, the independent centrist who is currently expected to win Sunday’s high-stakes presidential election in France, claimed on Friday night that it had been hacked and that thousands of its emails and documents had been stolen and subsequently released in an effort to derail the race. “The En Marche! Movement has been the victim of a massive and co-ordinated hack this evening which has given rise to the diffusion on social media of various internal information,” Macron’s campaign said in a statement. About nine gigabytes of data were posted to the anonymous document-sharing site Pastebin by a user named “EMLEAKS” on Friday and further disseminated by users of the bulletin board 4Chan. The campaign says that both authentic and fake documents were published in the dump. French election authorities are now investigating the Macron campaign’s claims and urging the country’s media outlets not to report on the data. Macron is facing off against far-right populist and nationalist Marine Le Pen in a runoff election on Sunday, and he had further expanded his lead over Le Pen in opinion poll results that were released on Friday. The election is widely considered the most important French presidential race in decades, particularly since a win by Le Pen would likely put both France and Europe on the path to dramatic and right-ward changes — though it’s worth adding that in many ways, the real strength of the next French president will not be decided until next month’s parliamentary elections. Midnight Friday was also the official end of campaigning in France and the beginning of a legally mandated ban on campaign communications through the election, meaning that neither the Macron campaign nor the Le Pen campaign will be able to comment on the contents of the hacked data. Indeed, the Macron campaign reported the hack just minutes before the communications ban went into effect. The vice-president of Le Pen’s National Front political party also publicized the #Macronleaks on Twitter before the communications ban, alleging that the data might expose Macron in ways the country’s media never would. France’s National Commission for Control of the Electoral Campaign, however, has warned French media outlets not to report on the contents of the hack, reminding them that “the dissemination of false information” is against the law. The Macron campaign made a similar request in its statement on Friday. [S]ome of [these]“facts” aren’t facts at all. These days, hacks are primarily fodder for a misinformation campaign to be conducted mostly online. Researchers have already found that pro-Trump Twitter accounts (with #maga, or “make America great again,” in their handles) are heavily promoting Marine Le Pen, and the leak hashtag may well have started in the US by an alt-right Trump supporter. Reporters have already documented the 4chan trolls actively promoting fake claims of corruption, and watching with glee as traditional media tried to debunk the claims — because debunking is a form of repeating false claims and giving them more publicity. She adds that the Macron data dump was clearly meant to spread misinformation in an act of asymmetrical political sabotage, and as such, should be treated and reported on accordingly. As far as who carried out the attack, the New York Times reports that some security experts believe that, as was allegedly the case regarding attempts to disrupt and intervene in the U.S. presidential election last year, Russia-linked hackers are likely behind the attack on the Macron campaign. Le Pen has clearly been the preferred candidate of the Russian regime, having received preferential coverage from Russian state-run media as well as Russian financial support over the years for her and her National Front Party. The Macron campaign was also targeted by a sophisticated phishing attack in March, according to cybersecurity experts. There was also a debunked rumor, based on a forged documents shared on social media, that Macron held offshore bank accounts — an allegation that Le Pen herself helped publicize during Wednesday’s televised debate. Le Pen’s campaign has said that it has also been the target of hacking attempts and this week reported that French police had arrested a suspect with ties to the extreme left in relation to those attacks — though that report has not been confirmed, and it does not appear that any of the Le Pen campaign’s documents were compromised.